(Natural News) Opioids are the class of pain-relieving drugs made from the illegal and deadly drug heroin. Fentanyl is by far the most dangerous, but you’ve certainly heard of some other popular ones, including oxycodone (a.k.a. Oxycontin), hydrocodone (a.k.a. Vicodin), morphine and codeine. Fentanyl is so strong that just a few too many milligrams can cause a human to overdose and die. If terrorists were to make a dirty bomb using around 1500 pounds of Fentanyl, they could wipe out every person in America. Fentanyl, a suped-up form of heroin, kills humans by reacting with receptors on nerve cells in the body and the brain. Even when “taken as directed” by America’s medical quacks, opioid pain relievers can lead to overdose incidents and death. Overdose deaths have been steadily increasing since 2007, including among teens. The production of heroin in Afghanistan has auspiciously skyrocketed since the U.S. invasion and occupation. Can you say “Big Pharma” controls the Military Industrial War Complex? The American workforce is being systematically crushed by Fentanyl abuse on the streets. Patients simply visit drug-slinging medical quacks and complain of neck, knee or back ache (none of which can be disproven), and voila. Then they sell those drugs to friends and other addicts, and revisit the doc (and his other cohorts) complaining of continued “pain.” It’s a simple “prescription” for drug addiction. Now, because of so many overdose deaths in our country, it’s becoming increasingly obvious that terrorists could simply dose our water supply with this legal form of an illegal drug and wipe out humanity with one huge “dose” of this silent-killing WMD. 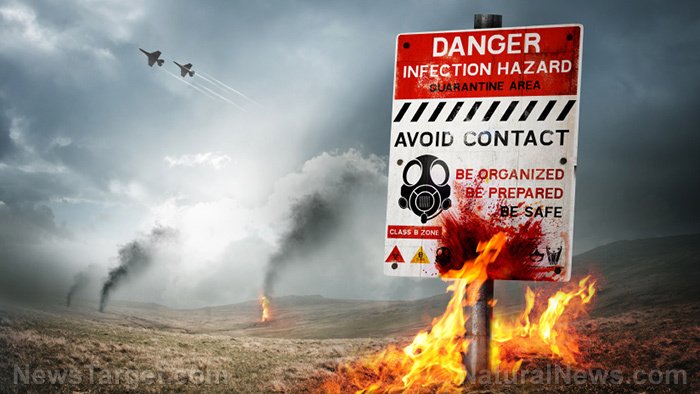 Terrorists could also spread the deadly drug by spraying it over heavily-populated cities in America as “chemtrails” that already spread bio-waste from hospitals. Fentanyl is super easy to manufacture. It’s mass produced in Mexico and China, then slung by drug dealers on the streets and by medical quacks in just about every doctor office and hospital across our drug-addicted nation. In case you’re thinking it’s not as bad as actually shooting up with smack (street heroin), think again. Fentanyl is 50 times more potent than heroin, and one small dose can even subdue an adult elephant. The drug is so deadly that a human baby can die just getting a little on its skin. Nearly 30,000 Americans died last year from Fentanyl overdoses, including children, according to the National Institute on Drug Abuse (NIDA). Fentanyl is now considered a biochemical weapon and a significant threat to the national security of America. Even the CIA agrees and are sounding the alarms. Fentanyl has already been used in a terror attack in Russia back in 2002, where Russian special forces pumped it into a Moscow theatre to “incapacitate” the attackers. What went wrong? Over 100 of the 800 hostages died from heroin overdose. The scene was similar to the Holocaust, when Hitler sent Jews into huge “shower” facilities and pumped in deadly Zyklon B gas (crystalline hydrogen cyanide). So where is the real “War on Terror” being fought and lost? On American soil, that’s where. The opioid epidemic claims 30,000 lives each year, while 90 million Americans (that’s 40 percent of the entire population) keep on sucking down those little heroin pills. If Big Pharma decided to triple the Fentanyl dose all in one week, it would be genocide across America. Meanwhile, criminal medical quacks are writing up to 100 opioid prescriptions per day. The so-called medical doctors are nothing more than glorified drug dealers taking bribes and kickbacks from pharma reps to “legally” dish out heroin. The “War on Drugs” is a “War for Drugs,” including Fentanyl, OxyContin, and Percocet. Doctors, pharmacists, and nurses are being arrested right and left for pocketing billions from pushing toxic medications through fraudulent schemes. It’s one huge “legalized” crime ring out there, and if we’re not careful, it’s going to turn into a Holocaust. Prescription drugs have killed more Americans than every war put together. Tune into BigPharmaNews.com for more updates on prescription drugs turning into weapons of mass destruction.